Ever needed to build an amp quickly? I first became interested in electronics because of the cool gadgets it could produce…and of course it had buttons. Always loved pushing buttons to figure out what they do… The fact that robots and space ships were all over the tv and movie scene of course had it’s effect as well. The interest was given a severe knock when I realised I had to do math and all kinds of other subjects at varsity level to be considered an expert. So instead of playing (experimenting) with electronics, and making ‘expensive smelling smoke’ (when the smoke comes out, it stops working 🙂 ), me and my classmates were being taught on paper how the things work in the real world. Don’t get me wrong: the theory behind how stuff work is immensely interesting, being tested on how much of it you can remember – not so much. I mean what’s the point if you can find all the info you need in a book or on the internet in any case, right? The magic of electronics were rekindled again when I worked on repairing some control boards for an induction furnace with an electronics veteran named Cyril Thompson. He needed to test a signal output on the board where we suspected a problem in the controls originated from, but the signal was not strong enough to find irregularities. 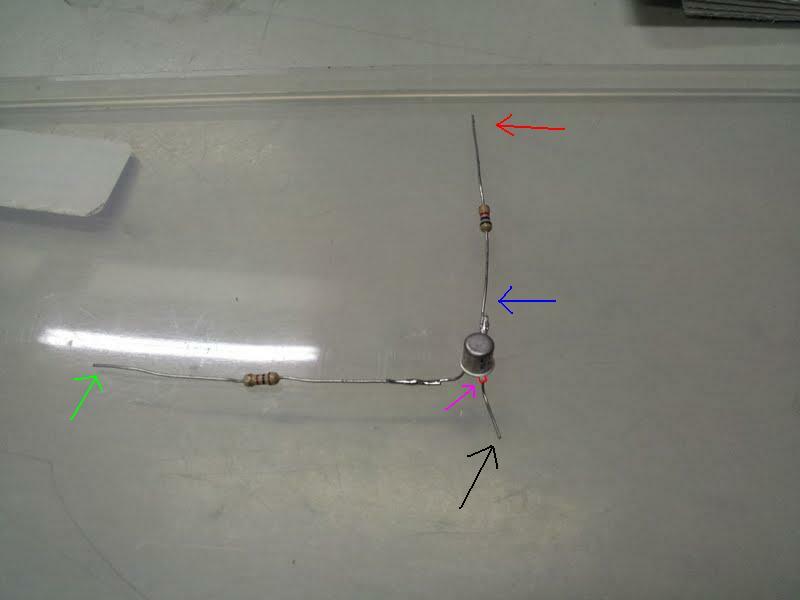 So he took a simple pnp Bipolar Junction Transistor (BJT) from his box of goodies, wired some resistors to it and created an amp within minutes. Point 1: on the schematic is the connection for the source signal (also called the input to the amplifier circuit). This is connected to the base of the transistor. Point 2: is the collector side of the transistor in this circuit. This is the point where Voutput is measured. Point 3: is the connection point for V1 which is normally referred to as Vcc and provides the power for the circuit. Notice that in my circuit I added a resistor between the source connection and the base of the transistor. This just protects the transistor a little by limiting the current to it. If the source that you want to amplify is very small this might not be necessary. Also take note that this is the most basic common-emitter circuit, and more complex circuits are required for different applications. That is all for now. Enjoy the “mystery” of electronics. Yes Anonymous, you can use this for a 0.25W speaker. Understand though that this is a VERY SIMPLE amplifier circuit and you might have to add some components (capacitors for example) to get a signal out to the speaker. Also take care of the strength of the signal you connect to the input. Look at the datasheet for the 2N2222 transistor to see if it meets you needs. Can i use this for a 0.25 Watt speaker?